Entrance to Japanese Village and Deer Park, modeled after a torii (traditional Japanese gate). The park's Japanese name is written from right to left. Orange County in the 1960s was a region transitioning from its agricultural roots into a suburban paradise for Los Angeles “white flight.” As the population reached one million inhabitants in 1963, the county was already the established tourist destination with a growing amusement corridor, which included Disneyland and Knott’s Berry Farm. 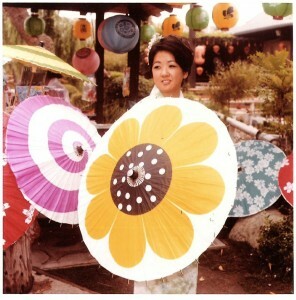 The author's mother, Sheri Nakatani (now Nakano), worked at Deer Park. Deer Park opened its gates less than 25 years after the end of World War II, during which the enemy nation of Japan became conflated with Japanese Americans (citizens and non-citizens) in the formation of a racial enemy of the state. Deer Park, then, may be understood as a reflection of Cold War multicultural politics and the transitioning image of Japanese Americans from unassimilable wartime foes to friendly neighbors and model minority. In the beginning, the park was little more than an enclosed pen with a small herd of sika deer gifted to Parkinson from associates in Japan. 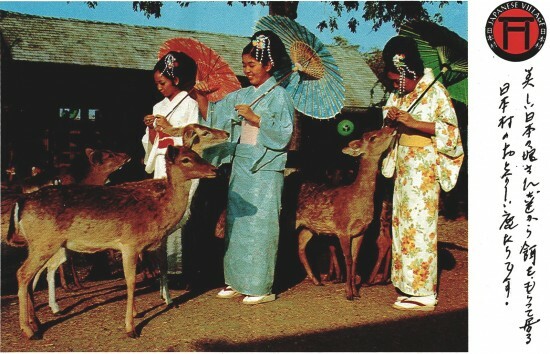 Patrons were greeted by kimono-clad hostesses who sold rye crisps to feed the deer. The deer pen was joined by a dove pavilion, tea house eateries, gift shops, and koi pond. At its peak in the early 1970s, Deer Park had expanded to include a pearl diver lagoon and amphitheaters and stadiums for cultural performances as well as animal shows featuring sea lions, dolphins, bears, and tigers. While the park attempted to replicate the deer parks in Nara, the question of authenticity was one that could produce multiple answers at Deer Park in terms of the ambiance, architecture, entertainment and park staff. Parkinson took great pains to maintain authenticity in terms of architecture and landscaping. He commissioned Japanese-trained architects and gardeners to create the facades of the restaurants, gift shops, walkways and amphitheaters. 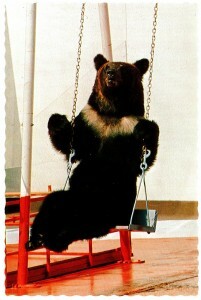 The animal acts included trained Hokkaido black bears from Japan. Unlike most present-day theme parks, Deer Park’s attractions focused on a variety of shows and did not feature any rides or roller coasters. Similar to the architecture and landscape, Deer Park’s shows attempted to expose the largely white, middle-class patrons to the authentic culture of a “Japanese village.” Performers in the tea ceremony, dance, and karate shows were classically trained in their craft and generally immigrated from Japan as adults. The dance and karate demonstrations included performances by local U.S.-born youth, often Sansei, who were students and trained by the main adult performers. The authenticity of the cultural performances, however, stands in stark contrast to the animal shows, which held strong entertainment value but little basis in the “enchantment of old Japan.” The bear show often sticks out in the minds of former employees and visitors. Many noted that they had never seen anything like it before or since. The bears were, in fact, Hokkaido black bears from Japan that dazzled guests by walking on their hind legs, dressing in costumes, sitting on swings, sweeping the stage with a push broom, and playing on a see-saw. Many park guests were so impressed by the bears that they were convinced they were men dressed in bear costumes! Similar to the park’s entertainment, the park’s staff also traveled back and forth across the line of authenticity. The proprietors of Deer Park sought a staff that was in keeping with the authentic façade of Japan and found a ready workforce among high school and college-aged Sansei from the surrounding communities. As previously mentioned, some of the performers, as well as the landscapers and chefs, were immigrants from Japan; however, nearly all the client-facing Deer Park staff were local Sansei. After hours, the Sansei employees got together for parties. The Sansei employees certainly fit the part in terms of appearance. However, these third-generation youth saw themselves as true “all-American” kids. The majority of employees grew up in the new suburban communities and farms in North Orange County and South Los Angeles County. They generally associated with white peers as they were often one of only a few Japanese Americans in their neighborhoods and schools. Numerous former employees joked that they thought they were just like everybody else and were shocked by the Asian reflection they saw in the mirror! Other employees did have significant interactions with other Japanese Americans growing up either because they attended Japanese American churches or other community organizations or grew up in communities with sizable Japanese American populations, such as Gardena. For those employees who grew up immersed in Japanese American communities, Deer Park was merely one instance in a long sequence of life experiences among Sansei peers. Regardless of where they grew up, the third-generation American youth employed at the park performed their version of Japaneseness, learned from their largely Nisei parents, for white park patrons. The “Japanese” culture that many of these youth grew up with in their homes, however, was distinct from the contemporary and “ancient” culture Deer Park attempted to portray. The Japanese culture of the Sansei was in fact Japanese American — Japanese culture from a particular time and place within Japan that had been altered to fit the American context. Often, Deer Park was the first sustained exposure to “real” Japanese culture for many Sansei and helped them to gain a greater appreciation and pride in their cultural heritage. The Japanese cultural theme of Deer Park was an initial attraction for many prospective employees and made employment easy to secure. However, culture played second fiddle to the importance of the people and relationships found at the park. For many of the employees, Deer Park was the first time that they associated with a large number of Japanese Americans of their own age. While most of these Sansei were active participants in their communities and school and generally felt well integrated, an equal numbered recalled a lingering and unshakable sense of being different from their white peers despite friendships and similar interests. For those Sansei who had a handful of other Japanese Americans in their schools, different interests or the perceived “nerdiness” of Sansei classmates kept many former employees from affiliating with other Japanese Americans prior to Deer Park. At Deer Park, Sansei were exposed to a critical mass of other Sansei with a diverse set of interests and personalities. Within this large population of fellow Sansei, employees were able to find other Japanese Americans with similar interests and built strong, lasting relationships and a sense of community. Within this community, many employees commented that they found themselves and were able to transfer this new sense of self to other areas of their lives beyond Deer Park. Former employees note the many friendships forged at Deer Park and the vibrant social life that occurred after hours. Outside of work, employees organized a bowling league, social clubs, a sports night, car rallies, and dances. Several former employees recall spending nearly all their time with Deer Park friends over the summer, going from a full work day then out to dinner and over to someone’s house to play board games into the wee hours of the morning just to go home to sleep, wake up, and do it all over again. While many Sansei reported friendship with non-Japanese classmates and kids from their neighborhood based on similar interests, Deer Park friendship provided something different. One former employee joked that it was great to meet people who “ate with chopsticks and white rice all the time.” But more than the common cultural idiosyncrasies, Deer Park relationships provided an additional level of comfort and understanding. Deer Park employees shared the common experiences of growing up Japanese American in a still white-dominated society. Many Sansei met their future spouses at Deer Park, built families and laid the foundations for the fourth generation. As a testament to the lasting nature of Deer Park relationships, a reunion was held in 1986, over 10 years after the park closed, with over 200 attendees, including former employees, family, and friends. 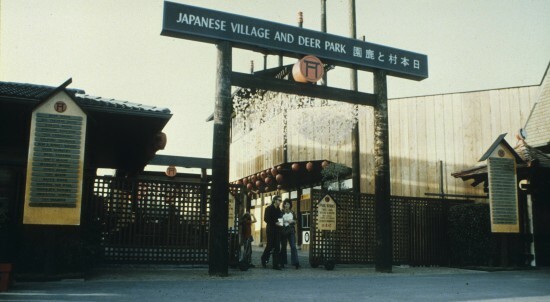 Japanese Village and Deer Park closed its doors in December of 1974 due to dwindling park admission sales. In 1970, the park had been sold by Allen Parkinson to the Six Flags Corporation. However, it seemed the new owners, used to running ride-based parks, were unable to maintain the innovative rotation necessary for a show-based amusement park such as Deer Park. While Six Flags’ struggles led to Deer Park’s ultimate demise, former employees have commented that the corporate management of Six Flags marveled at the camaraderie and high employee morale that permeated the park, unmatched at any other Six Flags location. Such community and morale was credited for helping keep the park going even after its prime. Despite its short eight-year existence, Deer Park made an indelible impression on the lives of former employees and the history of Japanese Americans in Southern California. Many former employees lamented that there wasn’t a place like Deer Park available for their Yonsei children. But, even if Deer Park, or anything like it, no longer exists, it continues its impact through the memories and maintained connections of former employees. 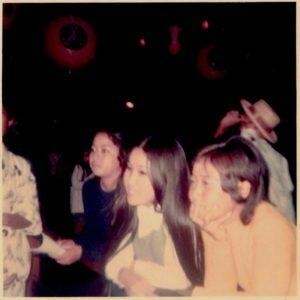 Deer Park allowed them to find and build a community that enabled them to strengthen each other, themselves, and the broader Japanese American community for future generations. Dana Nakano, the son of two former employees who met at the park (Gary Nakano and Sheri Nakatani), is currently working on a study on the history and community that grew out of Deer Park for his doctoral dissertation in the Department of Sociology at UC Irvine. As part of his dissertation, he is conducting interviews and collecting memorabilia with former employees and people who have memories of the park. If you are interested in participating in the study, contact him at [email protected] or (714) 451-6763. 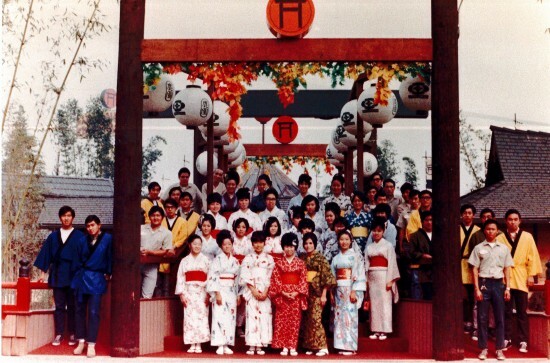 Deer Park employees gather on a Japanese-style bridge for a group photo. 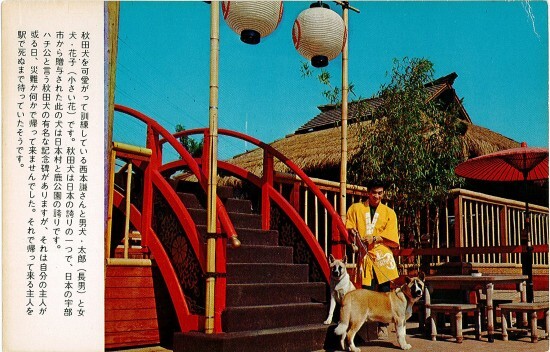 A promotional photo shows two Akita dogs, Taro and Hanako, being trained by Ken Nishimoto. The caption says that Akita dogs are the pride of Japan, and these two dogs, a gift from Ube City (Yamaguchi Prefecture), are the pride of Deer Park. The caption also mentions that Hachiko, the faithful dog who waited for his master at the train station for many years after the man had died, was an Akita. I was there, during the peak of the “Deer Park” days in the early 70’s when many Japanese-Americans visited Deer Park both for the social interaction with other Japanese-Americans, but to enjoy Japanese food, and also entertainment from the many up-and-coming Japanese-American rock bands that had their start in the community. Many life-long friendships can be attributed to Japanese Village & Deer Park; myself being one of them. Many thanks for the insightful, heart-warming article.